Bergen was the capital of Norway until 1299 when the capital was moved to Oslo. Today this enchanting city is the second largest city in Norway, and is rich in culture. The Bergen Philharmonic Orchestra is the oldest in Europe, and Bergen is also home to artists, musicians and theatre. 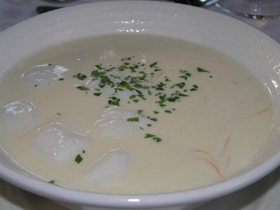 During a 2-night stay in Bergen in August 2005, Edward F. Nesta and I discovered three very appealing restaurants. Bryggen Tracteursted, is located on the Wharf, and is part of the UNESCO’s World Heritage Sites. Built in 1708, renovated and reopened, it provides a glimpse into the past, with its green wood walls and red trim, wooden ships hanging from the ceiling along with brass chandeliers, Damask white tablecloths and brass candlesticks complete the ambience. For dinner we began with their Bergen fish soup which had delicate fish dumplings, julienne carrots, fennel and was sprinkled with fresh minced parsley, followed by Prince cod which was topped with lobster and served on a bed of asparagus spears with fingerling potatoes, which we paired with a 2003 Saint-Bris Sauvignon from J. Moreau & Fils, from the Burgundy region. It was an aromatic wine with herbs, black currents and fresh ripe fruit on the palate with 12% alcohol. For dessert, we had their Low Country Lass, which was like a crumble, and was a parfait of cooked apples, cinnamon, breadcrumbs and topped with whipped cream. Kafe Kippers at the USF Arts Center was once a sardine factory, but it is now a multi-art center, as well as a restaurant. It was a gorgeous warm sunny day, and we had lunch at an outside table with a view overlooking the fjord. Lunch began with carpaccio, followed by skewers of monkfish, scallops and shrimp accompanied with saffron rice, a ghee sauce and grilled vegetables of zucchini, red peppers and onions, which we paired with a 2004 Delle Venezie Lamberti Santepietre Pinot Grigio, with 12.5% alcohol, which was dry and fruity and cultivated in Trentino near Veneto. For dessert, we savored the blueberry crème brulee served with honeydew and mango slices, and watched the boats pass by. Pascal Mat & Vin at the Neptun Hotel is an informal bistro located on the first floor of the Neptun Hotel. 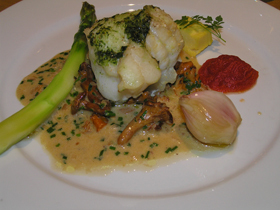 For dinner, we had their fish soup, followed by Cod with a pesto crown served over chanterelle mushrooms, asparagus and parsley potatoes. For dessert, we had their Tarte tatin accompanied by a crème brulee with fresh fruit and cream Anglaise. The Neptun Hotel has an interesting collection of artwork located throughout the hotel including the elevators, and is worth taking a stroll to enjoy their vast art collection after lunch or dinner. For other articles on Norway, please read our articles in the Destinations, Restaurants, and Chef’s Recipes sections. For more information on Norway, please visit: www.visitnorway.com, www.invanor.no and www.visitbergen.com.